Additional licenses can be purchased so many users can work in a QuoteSoft job at the same time. Full Network License Advantages: Users access the same cost, labor set-up, and job file data and share the same jobs and reports. QuoteSoft is designed for single or multi-user network environments. 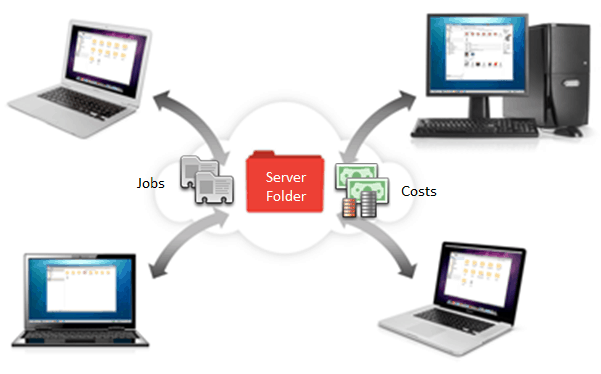 Maintenance of the labor and material cost are centralized on the file server. QuoteSoft can connect to AutoCAD and Revit BIM databases and import lists of duct, pipe, valves, equipment, and fittings. Each LT user has their own labor and cost database. Each LT user has a separate job file. QuoteSoft LT Jobs can be exported and emailed to a different user. QuoteSoft LT cannot connect to an AutoCAD, Revit or BIM database for automatic estimates.